Countdown 'til Daddy Comes Home is the story of a young boy waiting for his daddy to come home from a trip. To make their separation easier, his family creates rituals to stay connected and make the countdown fly by. A perfect book for military kids who have a parent deployed or kids who have a parent that is a frequent business traveler. 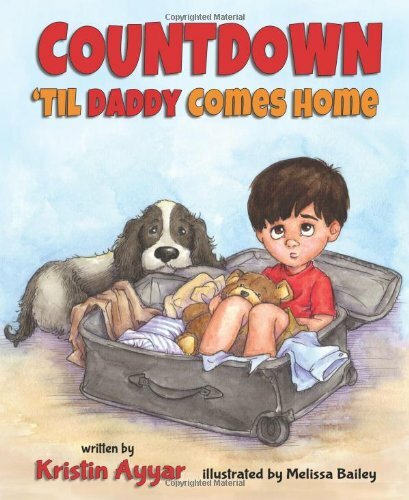 After reading this warmly illustrated story you will find ideas on various ways to countdown 'til your daddy comes home and discussion questions to set expectations and alleviate any fears your child may have because of their parent's deployment or trip. Inspired by her experiences, Kristin Ayyar shares how her family copes with the separations that are part of everyday life. About Melissa Bailey (Illustrator) : Melissa Bailey is a published author of children's books. A published credit of Melissa Bailey is Well, For Goodness Sake Little Jake.